A variety of excellent quality, brand name, awesome, NEW bicycles! We have mountain bikes, road bikes, BMX bikes, freestyle bikes, kids bikes, push bikes/balance bikes, hybrids, commuters, dual-sport bikes, beach cruisers, 29ers, 650's/27.5, full-suspension, plus bikes, cyclo-cross, single-speeds...we even have unicycles!! And if we don't have a certain model from one of our top-notch vendors, then we can special order it AND we'll price MATCH or BEAT any local competitor with in stock, same model, same size bikes! We are below MSRP. All NEW bikes come fully assembled, tuned and include 2 (two) years free tune-ups/unlimited adjustments!! We also sell USED bikes! All USED bikes are tuned, lubed, inspected, checked for safety, cleaned up and ready to roll! Re-cycle - buy a used bike! Sorry, we are currently NOT taking any trade-ins. ​Sorry, we DO NOT buy bikes outright. We have friendly, knowledgeable service. Feel free to ask us anything, anytime! No pressure sales! We will help you find the right size bike from us so you get the perfect fit! Test rides encouraged! REPAIRS! - REPAIRS! - REPAIRS! We have a full service shop with expert mechanics. Over 30 years experience in the industry! 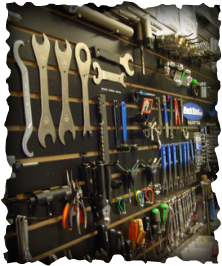 Bring your bikes in for service anytime! Best prices, quick turn around time. First come, first served. We try our best to get your bike ready and back to you as soon as possible! ​We service ALL brands of bicycles! Professional, detailed, full tune-ups & safety checks. We have VERY competitive rates and over 30 years experience!!! Anything from adjusting a brake to replacing cables and/or pads to bleeding an entire hydraulic brake-set. Anything from installing a wheel to straightening a wheel to building a wheel...you get the idea. Call, e-mail or stop by if you have any questions. 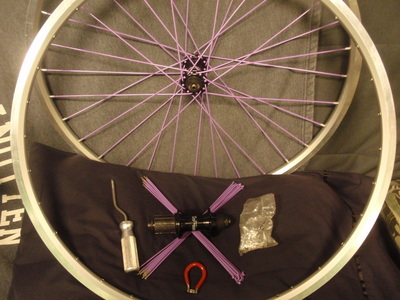 Major Overhauls and Restorations - Refurbish your old bike or get your newer bike back up and running like new! We especially enjoy restoring old vintage bikes! Check our facebook page for completed projects. ​Repair or service/maintenance. We can bleed your brakes, install new pads, install new hydraulic lines, rebuild calipers and levers, whatever you may need. Wheel building service - Get your old wheel re-built or let us lace you up a new, custom, strong, hand-built wheel-set! 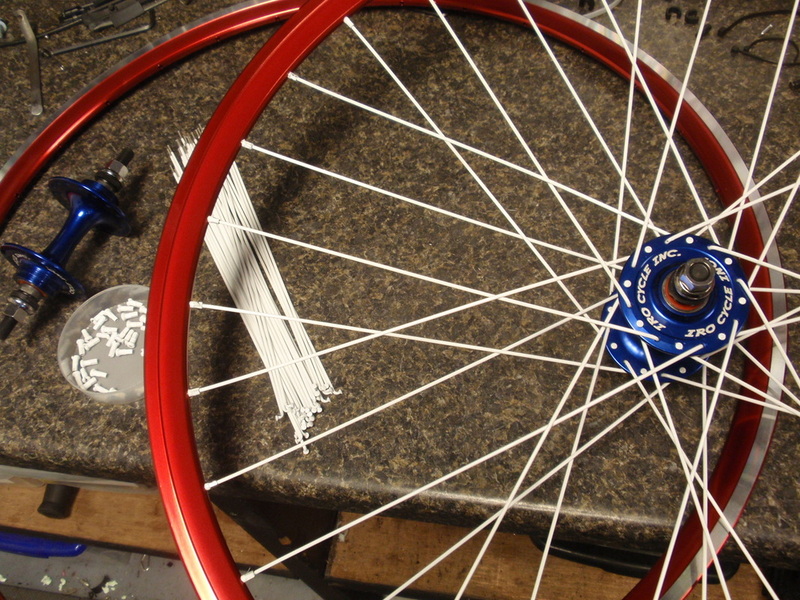 We've been building wheels since 1988! Our pricing can't be beat! Get that 'look' you're looking for! ﻿Suspension component service available for Rockshox, RST, Manitou, Marzocchi and Suntour. Front and rear shocks. We can install YOUR parts! Got a part off the internet? Not sure how to install it and adjust it? Want to make sure it's done correctly? Bring it in! FLATS WHILE YOU WAIT! We can install a tire and/or tube while you wait, usually within 10-15 minutes. 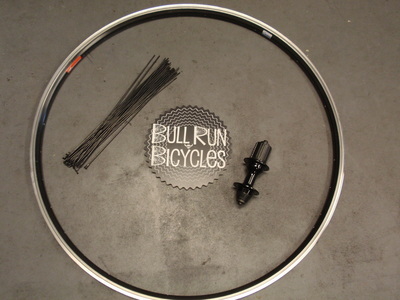 You'll NEVER pay too much at Bull Run Bicycles! We will beat or match ANY competitors labor rates. We greatly appreciate your business. You are always welcome to stop by and say 'hi', check out all the bikes, accessories, ask any questions and maybe meet some new riding friends. You'll always know where your bike is and where we are. We have lots of parts and accessories to personalize your bike and/or make your riding experience better, including colorful parts and items to make your bike custom, personalized and/or more comfortable! We have gift certificates! Don't know what to get that cyclist in your life? Get 'em a gift certificate and let them decide!! 90 day LAY-AWAY available! 25% down, pay it off within 3 months! BULL RUN BICYCLES has the BEST, coolest customers/riders! ​NO WORRIES!! Do you have a bike, a helmet and want to ride? Please join us on the areas largest, most friendly rides!! Greater Manassas Bicycle Advocacy Group! Manassas is an awesome place to ride a bicycle! Manassas Park, Prince William County and surrounding areas! Get together with fellow cyclist and get involved! Your voice matters! All bicycle related content. Group road rides on the weekends with a lot of the same riders from the BRBikes Tuesday Group Road Rides! Please 'LIKE' Bike Manassas on facebook. Local or otherwise, we appreciate the support! Since 2010, Bull Run Bicycles has been a surprising inspiration to area cyclist. Growing safe bicycling and the biking community. We have donated bikes, parts and accessories to the Boys and Girls Club & Manassas Park Police. We are honored to serve Manassas City Police and Fire & Rescue also. We have received several Certificates of Appreciation, a few from local Schools and even the U.S. Marines! We have helped start clubs and even businesses. ​Please consider us when it comes to anything bicycles. We can't thank you all enough!